Tannoy Definition DC8 review | What Hi-Fi? Compare the DC8s with the B&W PM1, Dynaudio Focus 160, PMC Twenty 22 speakers and you’ll notice a difference in the driver arrangement. While those other speakers feature a traditional tweeter positioned above the mid/bass driver, Tannoy’s 8in Dual Concentric driver is the heart of high, mid and low frequencies. 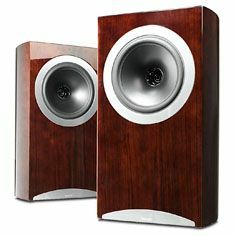 It’s a trademark design which features heavily in Tannoy’s other speakers, where a metal dome tweeter actually sits in the centre of the mid/bass cone. Tannoy believes this helps promote a more precise, coherent sound – and you’re certainly aware of this when listening to complex classical tunes. The DC8s do a great job of breaking all the elements up and arranging them all in a regimented, precise manner. The crossover’s circuit boards have been given the cold treatment – -190C of Deep Cryogenic Treatment, to be precise – after which they’re thawed. The process is designed to reduce possible stresses in the components and allow a more efficient transfer of signal. The cabinets’ trapezoidal design and parabolic curves have serious presence, while the lacquered Cherry real-wood veneer (shown) gives the classy finishing touches. At 47cm high, the DC8s certainly dominate the Dynaudios and B&Ws and they produce an appropriately authoritative and dominating sound to match. The larger cabinet design gives inherent advantages over rivals when it comes to scale and there are no issues filling a large listening room. Push the speaker hard and there’s little sign of distortion either. Play Like A Dog Chasing Cars from the Dark Knight OST and low frequencies hit with power and weight; there’s no shortage of drama and authority here. Timing and rhythms remain rock-steady, and the DC8s keep a tight grip on the arrangement of instruments, too.This is a bold, accomplished speaker, up there with the best.